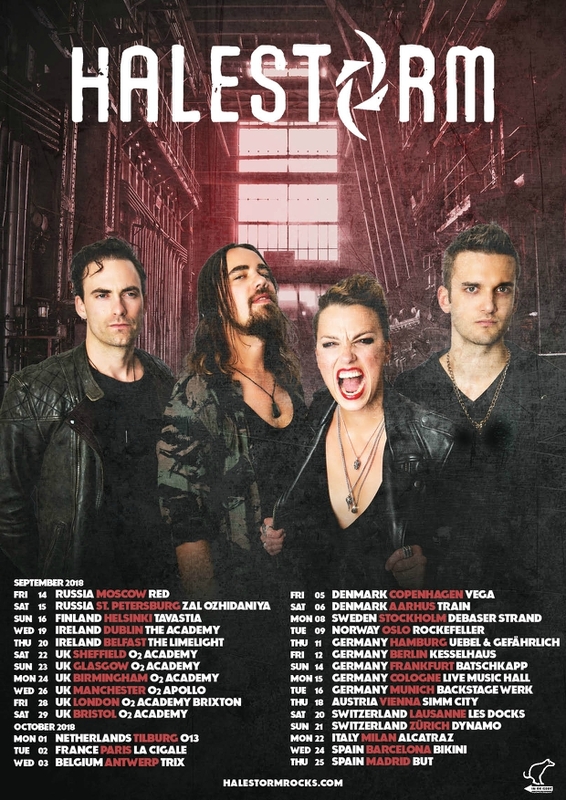 In case you’ve been living under a rock this morning, Halestorm have announced plans for their 6-week UK & European headline tour, kicking off in Moscow on 14th September and wrapping up in Madrid on 25th October. Widely acknowledged as one of modern hard rock’s most dynamite live acts, the trek includes 8 UK/Irish dates, including London’s O2 Academy Brixton for the first time. Hello, UK Freaks! We are so excited to return to you with our biggest headlining tour ever! And we are beyond pumped to finally get to perform at the legendary Brixton Academy, one of the places that has been on our rock n roll bucket list forever! Can’t wait to see all of you there! You can see a video message from Halestorm in the studio below. Special guests for the tour are still to be announced. Tickets will be available via pre-sale from 12pm GMT on 7th March and then on general sale at 12pm GMT on 9th March, via www.livenation.co.uk, www.ticketmaster.co.uk, venue box offices, and all good ticket agents. Investigate fan club ticket offers at www.halestormrocks.com. You can also catch them in the UK this Summer at the Ramblin’ Man Fair, where Halestorm are special guests to The Cult on Sunday 1st July. For more info, visit www.ramblinmanfair.com. The Grammy-winning, record-breaking group have been holed up in Nashville recently, working with producer Nick Raskulinecz on their fourth studio album, due out later this Summer on Atlantic Records. Join their 1.3 million Facebook ‘likers’ and check out some candid studio snaps the band have been sharing on their official page here. Talking to Billboard about the new album, charismatic frontwoman Lzzy Hale described it as “very rock. It’s definitely a step forward for us. I think you’re really going to see something that comes from all four corners of Halestorm, what each of us brings to the table and just how important all four pillars are in this band. We’re really pumped about having something new, and I just hope everyone likes it — and, regardless, we’re stoked on it.” The band have debuted one new song live so far, titled ‘Black Vultures’. Halestorm will spend April/May on the road in the USA, playing festivals and co-headlining a milestone North American tour showcasing all female-fronted hard rock groups.